One of my most anticipated films for this summer is PIXAR’s Brave. My husband and I always look forward to this time of year for every new PIXAR release. Since before there was even a teaser trailer or any kind of art work revealed for this film, my husband and I have known about it; I think he found some very limited information Wikipedia. The teaser trailer that I saw last summer in Los Angeles (as well as dozens of times on my own computer) only increased my desire to see this film. 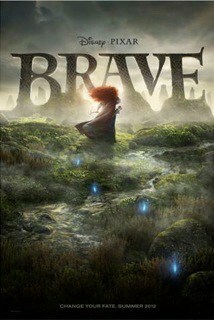 Finally there is a new trailer for Brave that shows off more of the story. This is a bit of a departure for PIXAR, whose films normally are centered around male protagonists. Of course there are strong females featured in all of the PIXAR films (Sally and Holly in Cars and Cars 2, respectively, Helen/Elastigirl and Violet in The Incredibles, etc. ), or they wouldn’t appeal to a female audience, but this is the firt time a PIXAR film will be totally centered around a female. Brave also features the voice talents of Kevin McKidd, Craig Ferguson, and Billy Connolly (whose voice I recognized as the narrator of The Ballad of Nessie). I’m particularly excited for the setting of this film, which is in the Highlands of Scotland, and also the epic musical score composed by Patrick Doyle. What aspects of “Brave” are you most excited about? Sounds like it’s going to be good! I love Disney/PIXAR movies. And I also LOVE that Craig Ferguson is going to be one of the voices in the movie. I love him! it looks like a good movie, but i’m honestly waiting for the new miyazaki film 😛 i’d rather see that then another pixar movie. The Miyazaki film is GREAT. We will be posting a review of it probably the week before it officially releases, so stay tuned!